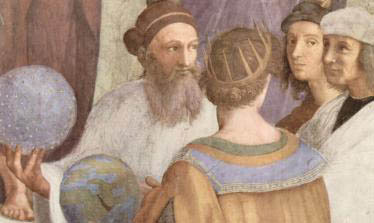 Raphael's portrayal in Vatican City of a bearded Zoroaster holding a sparkling globe. According to the Holy Book of the Magi, Zoroaster was born in eastern Iran and lived from about 660 BCE to 583 BCE. Like Moses (who is thought to have lived between 1600 and 1200 BCE), there is virtually no corroborative historical evidence for his life outside the religious writings. Most scholars place Zoroaster’s life earlier in history (as long ago as l200 - 1800 BCE), mainly due to the ancient Eastern Persian language he used to compose his Hymns (Gathas). Empire. The Magi, who at that time were priests of the old pagan religion in western Iran, accepted and taught the new religion of Zoroaster; some believe that Zoroaster himself was a Magus of the old religion prior to his divine revelations. His Hymns to God (Gathas), about the length of the Gospel of Matthew, were first recited orally and eventually written into the Holy Book of the Magi (Avesta). We know that he was assassinated by a rival priest at the age of 77 years. While Zoroaster claimed no divinity for himself, later traditions created miraculous stories that were characteristically attached to persons held in high esteem in the ancient world.A fond tradition claims that Zoroaster laughed (instead of crying) at birth! God is opposed by an evil force called “The Demon of the Lie” which Zoroaster described as “that which is not and never was”— almost as if he saw the devil as a vacuum. Satan is responsible for all death, destruction, decay, and darkness. Satan has no physical presence on Earth but does have the ability to corrupt God’s creation. However, Satan is dim-witted and disorganized and can be defeated by the Good! Both the ancient Magi and the modern followers of Zoroaster see God as Light, the oldest non-anthropomorphic conception of God. God is the light above us, around us, and within us. For Zoroaster, the contrast between light and darkness is always a metaphor for the conflict between Good and Evil. In speaking of the God of the Magi, the 3rd-century Greek philosopher Porphyry said, “God’s body is Light, and His Spirit Truth.” In more modern times, Einstein saw all matter as frozen light, and physicist Stephen Hawking stated, “When you break subatomic particles down to their most elemental level, you are left with nothing but pure light.” Sometimes observers of this religion from ancient to modern times have mistaken the Magi for fire worshippers because of the “eternal flame” present in all of their temples. However, the fire has never been worshiped; the flame of the fire represents LIGHT, their symbol for God. more ill-favored and hideous than thee.” In reply, the ill-favored wench says, “I am no wench, but I am thy deeds – hideous deeds – evil thoughts, evil words, evil deeds, and evil religion.” The Bridge then becomes razor narrow and the soul falls into Hell. This same razor sharp bride imagery lives on in Shiite Islam. God. Tradition and, more importantly, followers of the modern Zoroastrian religion interpret them literally as Archangels. The Magi also believed that there were Earth Angels of which the prophet Zoroaster was one. Dr. J. J. Modi sees parallels between the Christian angel Michael and the Zoroastrian angel Mithra, as well as between the Christian angel Gabriel and the Zoroastrian angel Sraosha. The name of Mithra may sound familiar to Westerners because of a heretical cult during Roman times that extended as far west as England . This “mystery religion” (which allowed only men) worshipped Mithra as a god, and its popularity is said to have rivaled the early Christian movement. Curiously, Mithra’s birthday is December 25, a date adopted later by the Christian Church for Christmas in its effort to discourage participation in this pagan celebration. Mithra is still worshipped as a god in India . However, in the orthodox religion of the Magi, Zoroastrians consider Mithra “only” an Angel and not even an Archangel! Sophy Burnham, author of A Book of Angels, credits Zoroaster with the development of the concept of angels. Before their contact with the Magi, the Hebrews often refer to the messengers of God as simply men (as in Genesis 18 when three men, one of whom is God, appear to Abraham). After their contact withthe Magi, Judaism and later Christianity and Islam have a well-developed system of Archangels and Angels. ever dies or decays, and there is no darkness – only LIGHT. incomplete and unfinished, there is a capacity to alter the status quo. That is why humanity must be active in helping God to overcome evil. The Zoroastrian scholar and modern-day believer, Prof. Farhang Mehr, sees Zoroaster as a pure monotheist who taught ethical dualism rather than cosmic dualism. Christianity is never doubted. Satan is a very real and powerful being to Jesus; he is tempted by Satan in the three Synoptic Gospels (Mt 4:1-11, Mk 1:12 -13, Lk 4:1-l3). He asks, “How can Satan cast out Satan? If a kingdom is divided against itself, that kingdom cannot stand” (Mt.12: 25-26, Mk 3:23-24, Lk 11:17-18). In Ephesians 6:11 , Paul writes, “Put on the whole armor of God so that you may be able to stand against the wiles of the Devil.” The proponents of cosmic dualism feel comfortable with modern-day “Process Theology” which expresses the idea that God cannot bestow free will and remain all powerful. A concept in modern physics that may reinforce the reality of cosmic dualism is that “a little chaos” is present in every atom of the Universe. Although the Persian Empire fell to Alexander the Great (331BCE), the Magi continued to be very influential throughout the Middle East and the Western World, and the religion of the Magi continued as the primary religion in the middle east until the Moslem conquest (642 CE). The Magi were prized as teachers of great wisdom and power, and Zoroaster remained a highly respected figure. Of course, Zoroastrian ideas have been enormously important to subsequent religious thought. Many scholars contend that it was Zoroaster’s cursing of the Hindu gods that initiated the break between the religious approaches of the East (Hindu, Buddhism) and those of the West (Judaism, Christianity, Islam). In the Dead Sea Scrolls of the Essenes, the imagery of the “Sons of Light” and “Sons of Darkness” is a direct borrowing from the Religion of the Magi. Six hundred years after the Moslem conquest, the Sufi Mystic, Attar of Nishopur, wrote, “we are theEternal Magi, we are not Muslims”. The Cypress slender Minister of Wine in the Rubaiyat of Omar Khayyam is a Magi. Omar Khayyam once said he wore the belt of a Magi because he was ashamed of his Islam. Zoroaster taught that God loves us all and that, after evil is finally defeated, ALL humanity will be saved at the end of time, although those whose bad deeds outweigh their good deeds will need to be “purified” in Hell before joining God in Heaven.